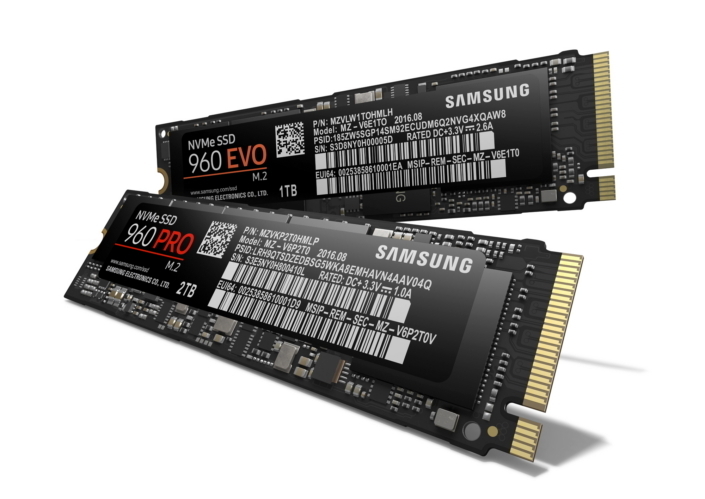 Samsung Electronics, a worldwide leader in advanced memory solutions for more than two decades, today unveiled the Samsung 960 PRO and 960 EVO, its newest solid state drives (SSDs). The V-NAND based, M.2 form factor SSDs were built on the company’s category-defining Non-Volatile Memory Express (NVMe) SSD leadership. With powerful performance, endurance and capacity topped with all new and more robust Samsung Magician software package, Samsung continues to accelerate the NVMe era. Packed with more technology and innovation than ever, the 960 PRO and 960 EVO are designed for users who seek smaller and faster storage solutions that deliver higher bandwidth and lower latency for processing massive amounts of data for everything from gaming and large file transfers to 4K video rendering, data analytics and more on their ultra-thin notebooks and PCs. Both the 960 PRO and 960 EVO use the Peripheral Component Interconnect Express (PCIe) Gen.3 x4 lane interface and are compliant with NVMe specifications to realize effective use of the high-speed PCIe bus and optimize both hardware and software configurations to take advantage of the NVMe SSD technology. The SSDs feature Samsung Dynamic Thermal Guard technology to manage performance during extreme workloads. On top of being the world’s fastest M.2 NVMe- SSD, the 960 PRO will also offer 2 terabyte (TB) capacity, which is the highest capacity commercially available for M.2 NVMe SSDs, along with 512GB and 1TB versions.2 The 960 PRO’s high density was made possible by Samsung V-NAND technology and the uniquely restructured package design. As user capacity demand trends continue to rise, the high-density 960 PRO capacities are poised to conveniently meet the needs of personal data and information storage. The 960 PRO promises additional reliability and endurance with the five-year limited warranty and up to 1.2 petabytes written (PBW), whichever occurs first, for the 2TB capacity. “We were proud to erect the NVMe era last year with the introduction of our 950 PRO SSD. Now, with the introduction of the NVMe 960 PRO and 960 EVO SSDs, Samsung is once again taking the next step in the multi-terabyte SSD technology and the storage revolution, providing users higher capacities and speeds than ever before within an NVMe PCIe drive to create new possibilities for consumers and business professionals,” Kim added. The 960 EVO is available in 250GB, 500GB and 1TB capacities3 and provide users with next-generation personal computing performance. The new Samsung Intelligent TurboWrite technology makes its debut in the 960 EVO and accelerates sequential read and write speeds, that reach peaks of 3,200 MB/s and 1,900 MB/s respectively.4,5 The 960 EVO’s random read speed reaches up to 380,000 IOPS and random write speed up to 360,000 IOPS.6 The 960 EVO comes with a three-year limited warranty and up to 400 terabytes written (TBW), whichever occurs first, for the 1TB capacity version. In addition to the industry leading performance, capacity and the reliable warranty-backed experience the 960 SSDs offer, Samsung is also introducing the all-new and fully rebuilt Magician software with a new user interface with which users can control various SSD settings including firmware updates. The 960 PRO and 960 EVO SSDs will be available worldwide starting October 2016, with manufacturer’s suggested retail prices starting at $329.99 and $129.99 USD respectively. For more information, including warranty details7, please visitwww.samsungssd.com.